The two boys walked around the shop for a second time. 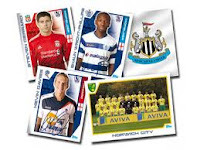 Both aged ten, they were addicted to football stickers. The few they were missing had to be in the box on the counter. They conferred on the pavement. When the old man reached up to retrieve the toy, Jack swiped the box. He was met at the door by a fierce looking woman. A drabble is a story of exactly one hundred words. Rob - I really do enjoy your Drabbles. You use dialogue very, very effectively! And half of nothing is?